James Johnston was the eldest son of Joseph and Mary Jane Johnston. James Frazer Johnston was born in Clogher on 19th May 1897. He was first of five children, all sons. His father was a constable in the Royal Irish Constabulary. By 1898, the family had moved to Carrickmore. His father retired in 1910 and the family moved to Blacklion in County Cavan, where they opened a drapery shop. 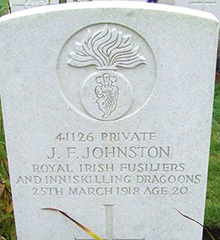 James Johnston enlisted in Enniskillen in March 1915. 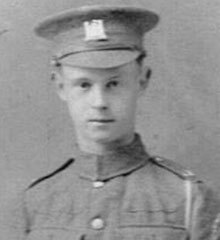 During the battalion's retreat from St Quentin in the German Spring offensive of March 1918, Private James Johnston received a head wound. Private James Frazer Johnston was serving with the 9th (North Irish Horse) Battalion of the Royal Irish Fusiliers when he died of his wounds on Monday 25th March 1918.